Anyhoo, I wanted to share a card I made with some of the latest Polka Doodles Products. The cottage and tree are actually separate stamps, so there was a bit of masking going on here. I've coloured various houses up a few times recently, and I don't know what it is, but I find them, well, hard! Trees... no problem. Houses... hard! I luv , luv this house. Can you leave it out on yer desk please for me to have a play. Coming up right away!!!!. Off to have a look at the Graph'it challenge. Do they do skin tones only cos that's the only ones I got. Hugs Muver. Have a fluffy fun weekend, Faye!! Love this, Faye! Fab coloring! Have a nice weekend! 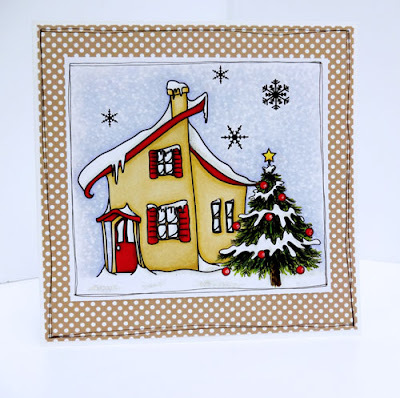 Very cute card, love your colouring of the house 'cause I agree, it's hard ! Gorgeous card Faye, I like thee house , the colours and the spotty paper. Gorgeous card Faye, the colouring is great! I've added myself as a follower again, seems that blogger kicks you out sometimes, so silly of him. Have a wonderful weekend sweetie. Fabulous card Faye. I love the scene you've created.